Could “Zionism” have been part of Communism to deceive and destroy “Christianity ” in America? 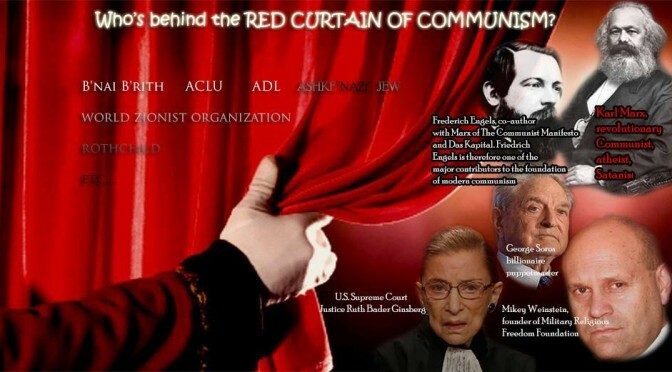 During America’s “red scare” the HCUA investigated every aspect of communism including it being a front for established religions. Dr. Joseph Goebbels referred to communism as “iniquity behind a political mask”. Could the beginning of biblical prophecy of Ezekiel 38 and 39 started with Rothschild’s purchase of land in Israel in 1917? Are we locked into a covert Holy War with communist military stragety of Sun Tzu? Sun Tzu stated the battle is won before it’s fought. The Laws of Nature and Nature’s God (LONANG) are the true foundation of America Law. The constitution’s “establishment clause” prohibits favoring any religion even Christianity over another. It seems “established religions” should be defined as religions whose religious books serve as their government and common laws which eliminates freedom “of” religion. Even Atheism has benefited from Constitutional religious freedoms. The laws created during “Founding Era” were meant to be followed to ensure “Morality” in our “Republic” the true power against tyranny. The “Laws of Nature and Nature’s God are mentioned in the Declaration of Independence. Could the founding fathers pledge have been a “covenant” with “Nature’s God “Supreme Judge of The World” ? The Son’s of Liberty published (CA) Sen. Jack B. Tanney head of (HCUA) House Committee on UnAmerican Activities.